Give into what you crave, but don’t overdo it — do it better. By Admin In Uncategorized with Comments Off on Give into what you crave, but don’t overdo it — do it better. Whether you’re cheering on the Eagles or the Patriots — or just tuning in for the commercials and the halftime show, like me — odds are you’re looking forward to the game day spread. Nearly half of Americans have Super Bowl party plans, according to research by the National Retail Federation, and Super Bowl Sunday marks the second leading food fest of the year (coming in right behind Thanksgiving, of course). For millions of hungry fans, Super Bowl is synonymous with chips, nachos, wings, and beer — a menu that won’t score you any nutritional points, and worse, can mean more than a days’ worth of calories in one sitting. Though it’s OK to mindfully indulge in your favorite foods from time to time, a better game plan is to find crave-worthy eats that won’t leave you with the day-after bloat that comes from overdoing it during the event. To help you do just that, I scoured Pinterest (we eat with our eyes, after all) and the world of healthy food blogs to find crowd-pleasing apps that you can enjoy without a side of regret. 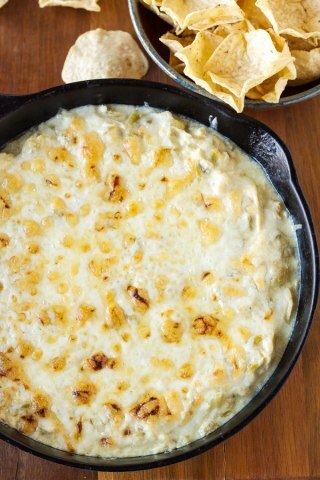 Thanks to the fistfuls of cheese and mayo, this popular dip can be over-the-top in terms of calories and fat. This version maintains the craveable creaminess while keeping things light, thanks to the use of Greek yogurt in place of other creamy bases. And using extra-flavorful feta means you can get by with less cheese. You can feel free to make this healthier version whenever the urge strikes, but also take a page out of Wendy and Jess’s book: Replace Greek yogurt for sour cream over baked potatoes, on top of chili or tacos, or to replace another creamy base in your favorite dip. Get the recipe. This party staple is so munchable, most of us manage to polish off more than a measly half-cup portion. Plus, a quick peek at the ingredients of the traditional packaged version reveals many unwanted additions. Added color, anyone? No thanks. 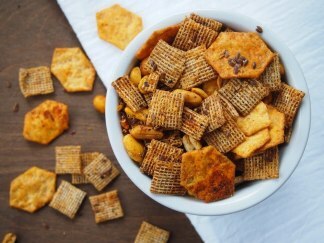 Keep the crunch and the flavor with this recipe, which sneaks in whole grain, gluten-free cheese crackers (by Van’s, a personal favorite) in lieu of the typical overly processed cheese crackers. It’s a smart move that means this recipe is rich in whole grains, foods that lower your risk of heart disease and stroke, while also making it easier to maintain a healthy weight. There’s even more to like: It contains only ingredients you feel good about eating. Talk about a touchdown! Get the recipe. Typical buffalo wings are dredged in flour and deep fried. A couple of those can serve up 240 calories, and that’s before they’re dunked in a rich bleu cheese dip. Cue the cauliflower! This genius spin, made with the oh-so-versatile veggie, is full of spicy flavor, but they’re just 12 calories a pop. 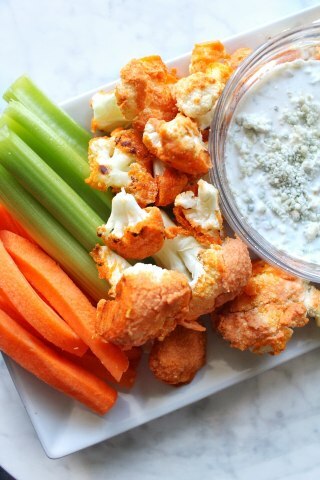 Plus, as with other dips featured here, the Bleu cheese served on the side is lightened up with 2% Greek yogurt in lieu of a high-cal base. It’s an appetizer you’ll want to keep on hand well after the game ends. Get the recipe. 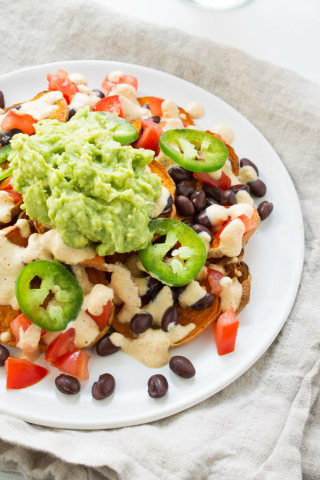 This game day staple gets a nutritious upgrade by swapping tortilla chips for thinly-sliced sweet potatoes, which are baked to crisps. The change brings more fiber, not to mention health-promoting plant chemicals, to your plate. But they’re still loaded up with all of the goodies: tomatoes, black beans, and guac (all health promoting foods on their own). This version is vegan; the cheesiness comes from a flavorful sauce made with a cashew base (a common cheese substitute in vegan fare). If you want to skip this step and don’t mind dairy, you could top your plate with regular cheese and still have a winning dish. Get the recipe. 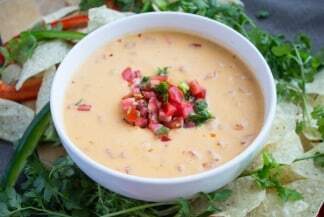 My love affair with queso dates back to my college days so when I saw this look-alike online, I developed an instant food crush. Though it still contains some cheese, the main base is packaged hummus — a staple in my fridge. This brilliant hack brings healthy fats along with plant protein and some fiber to a dip that’s typically low on nutrition. Serve it with whole grain tortilla chips on game day, or use it to top a baked potato or sweet potato any time. I have a feeling I’ll be turning to this quick snack over and over! Get the recipe. File this under too good to be true. You’ll be in cheese heaven with this knockoff, made with lighter ingredients, like Greek yogurt, low-fat cream cheese, and part-skim mozzarella cheese. 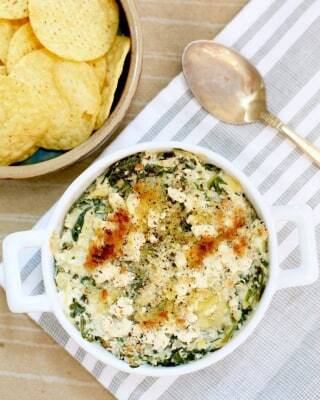 Green chiles and spices pack this dip with flavor so odds are, you won’t notice the trade-off. The recipe calls for cooked, shredded chicken, but if you don’t have time to whip that up in advance, a store-bought rotisserie chicken would be a good stand-in. That said, you still need to plan ahead as this dish is prepared in a slow cooker. Get the recipe. Some sneaky additions make this recipe a healthy alternative to the ordinary breaded and fried Super Bowl staple. As with other recipes, hummus replaces the creamy filling — a change that brings plant protein and fiber. The lesson here: Hummus is a great alternative to creamy ingredients. Finely chopped prunes and walnuts pack protective antioxidants, but they offer more than a health boost: The mix of sweet, salty, creamy, and crunchy ingredients is like a party in your mouth! Get the recipe.